Below is an abbreviated transcript of an 9-minute interview on June 28 with Markus Zwicker, General Manager of WestFor Management Inc. which was a follow-up on the interview of June 27 with Colin Hughes, owner of G&C Hughes Enterprises Ltd. and Colin Hughes Forestry. Hughes contends that cutting on Western Crown lands by the WestFor consortium is creating a fibre glut which is severely impacting smaller private owners and operators. Subtitle: WestFor licensed to operate on western Nova Scotia Crown lands, accused of flooding market. This morning, June 29, Julie Towers, Deputy Minister of Natural Resources was interviewed; the audio is available: The Province’s stand on WestFor and clearcutting (June 29, 2017 Season 2017, Episode 300296174). I will post an “abbreviated transcript” of that interview in the next day or two, for the record. Intro (LR): Some people, including small woodlot owners, are unhappy with how the province manages forested Crown land. At issue is a deal with a consortium of companies called WestFor. We have heard complaints about clearcutting close to Keji. More recently the Warden of Annapolis County told us they have asked the province to keep WestFor from cutting in their county. We heard from Colin Hughes [that Westfor is almost putting them out of business]… Marcus Zwicker is the General Manager of WestFor Management Inc.
MZ: WestFor is a company owned by 13 businesses in NS, that typically received or had Crown licenses from forested lands in Western NS. It was formed early in 2016, a conglomerate of all the individual licenses. DC: Are these mostly wood harvesting companies? MZ: No they are all consumers of fibre. DC: Ok they are consumers of fibre, and so WestFor then hires harvesters to go on the Crown lands? MZ: WestFor hires part of the harvesters. The other portion of the lands that are operated on are done so by the individual mills that make up WestFor. DC: The primary concern seems to be the harvesting of Crown lands in the western part of the province… and in a province where traditionally there has been a fairly good split between harvesting on private lands and on Crown lands [the concern is] that WestFor has way upped the ante on harvesting on Crown land to the detriment of the private operators. What’s your response to that? MZ: I listened to the interview with Colin Hughes. I have the same concern, I am a private woodlot owner myself. The market in NS has undergone a serious contraction in the past year and a half as Colin outlined…as a group WestFor makes up about 8% of the wood harvested in NS and well over 95% goes directly to sawmills, most of them, 10 of the 13 members of Westfor have relied on the fibre for decades to help feed their mills. MZ: Yup they span all the way from hardwood sawlog mills in Digby Co to hardwood sawlog and softwood mills in Scotsburn and New Glascow. So I guess the term is used more loosely in NS. Lloyd Hines used to talk about SW Nova Scotia as the fibre-basket of Nova Scotia. Now I don’t know what he meant by it. DC: If over-supply is the issue and if there is a consensus that private woodlot operators are an important part of the “economic fibre” of rural NS, you would think the province, because they control the Crown lands, would say you know what WestFor, there’s a glut, you guys have to cut back, we don’t want you putting the Hughes or the Zwickes out of business. MZ: last year our members bought more private wood than they have in 3 years. The issue is low grade fibre, pulpwood or energy wood, that’s the glut on the market. Today if you look across the province and my members in particular, very few of them have more than 2 weeks of inventory in their yards. DC: So you don’t think there is a glut? MZ: Not of saw material no. And that’s predominantly what we produce. We produce 90% saw material and there’s not a glut today, there is actually a shortage for some mills. DC: Most of the private land owners.. would you be selling pulp/energy wood? MZ: Today there is not a lot of market for energy wood/pulp from both Crown land operations and private. There is really only 1 or 2 consumers and none in the western part of the province. DC: Hughes suggested that WestFor has wood that they cut last year that they have no place to put yet they continue to cut this year. MZ: That’s correct but the low grade wood makes a very small percentage, the wood he is referring to is less than 5% of the wood that we harvest and we actively take mitigation.. steps to reduce the amount of pulpwood that we are making. 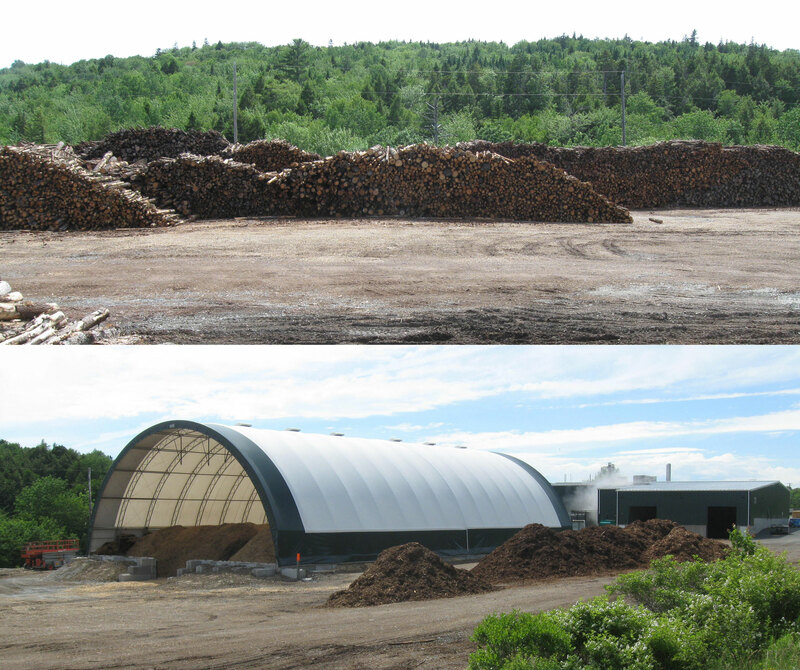 Over 80% of that grade of fibre in the province comes from private woodlot operations and we make most the wood that we harvest… again 95% goes to sawmills that currently need it. DC: What’s the nature of the agreement between WestFor and the province? MZ: So today it’s a short term license agreement that was signed in 2016; and it took the place of 13 individual license agreements that were directly between the Crown and the individual owners… the idea goes back to the mid-2000s, it spans the three different parties. DC: What was the advantage for the government? MZ: The complications around handling [separate arrangements], also some mills that had received fibre from the former Bowater-Mersey lands were offered a timber license but they decided not to be part of the group; there were three of them. DC: You are currently on a 6-month extension of the original contract. What happens if the government says we are not so sure? MZ: If it’s ended? I can’t answer that question today. There would be a lot of mills short, some of the mills that it (Crown land harvests) represents 20% of their fibre diet…it would put their mills in jeopardy. DC: Mr Hughes doesn’t sound like a panicky sort of guy; people called up and said there are people across the province whose livelihoods are hurting and their understanding is that it is your (WestFor’s) fault. What do you make of that? MZ: Try and deal with the facts. We deal with those concerns on a daily basis…as a group we have to collaborate, we have to think of innovative solutions, not just from private woodlot owners, they make up a large percentage of the forest industry in NS, so do the mills that buy the fibre.., most of them would work on Crown lands that me and our company manage. Primarily we have to work on solutions that consume that low grade fibre. The amount of wood being cut in NS has been reduced by almost 50% from 2006. That’s had a huge economic impact on both the private woodlot owners and the contractors, silviculture workers, the tree planters, everybody, most of them are small businesses that I deal with … I was on a bus trip last week with NGOs, MTRI, private woodlot groups, the government, went to Summerside PEI to look at how they converted oil-fired heating plants to bioenergy to consume a lot of the private fibre that’s in the area… that’s the kind of thing we need to work on as an industry and as a group if we are to continue to thrive in NS and provide that economic value back to the communities we all live in. It’s hard to square the comments of Mr. Zwicker with those of Mr. Hughes. This entry was posted in clearcuts, Economics, NSDNR, Private Woodlots, Pulp & Paper, WestFor. Bookmark the permalink.